One of the foremost Op Artists of the mid-Twentieth Century, Richard Anuszkiewicz (b. 1930) is widely known for his vibrating color combinations and use of simple geometric and linear forms to explore the nature of color and visual perception. Anuszkiewicz studied at Yale University with Josef Albers, a master of color theory and founding member of the Abstract Art movement. 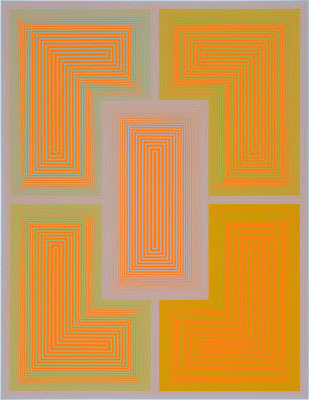 During the 1950's, Albers, Victor Vasarely, and M.C. Esher were experimenting with Optical Art and using such visual devises as moir patterns, vibrating color effects, confusing foreground-background relationships, and exaggerated perspective to create optical illusions. 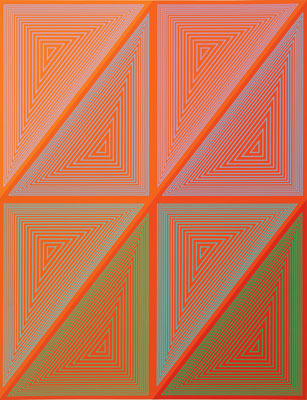 By the 1970s, Anuszkiewicz along with Vasarely, Bridget Riley, and others, become known as Op Artists as their work furthered the explorations of optical effects. Anuszkiewicz's work is carefully (almost scientifically) planned and executed. His compositions are symmetrical, uniform, and flat; they offer little in terms of physical depth and space. Technically superb, the work is impersonal and cool, focusing solely on color and its function as the subject of his images. 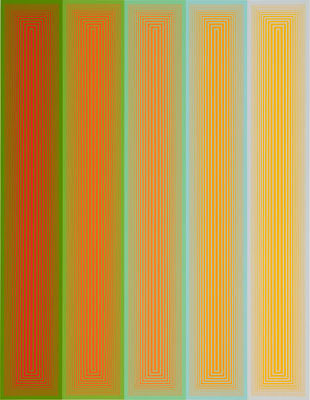 Inward Eye offers a compilation of the diverse compositional approaches and color experiments that is typical of Anuszkeiwicz's work in his early career. Inward Eye was produced by the Aquarius Press and printed in Baltimore in 1970. It consists of 11 images each with individual folios and words by William Blake. The complete set of images and folio pages are presented in this exhibition.